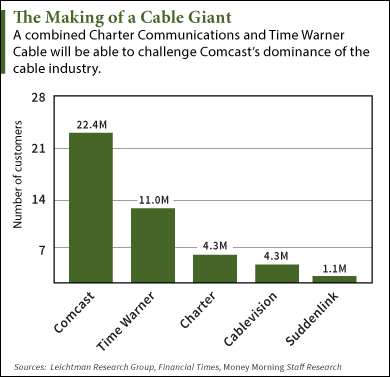 The Charter-Time Warner merger is part of an industry consolidation that is far from over. After several weeks of intrigue, Charter Communications Inc. (Nasdaq: CHTR) won the race for the hand of Time Warner Cable Inc. (NYSE: TWC). Charter beat out several other suitors, including hungry French rival Altice SA (AMS: ATC). Despite a just-announced $9.1 billion deal to buy Suddenlink Communications, Altice was said to be lining up financing for a bid to acquire Time Warner Cable. The intense interest from Altice likely inspired a more rapid consummation of the $55 billion Charter-Time Warner merger. Including debt, the deal totals $78.7 billion. Charter is also going through with a $10.4 billion acquisition of privately held Bright House Networks. The combination of the No. 2 and No. 3 cable companies in the United States will create an industry giant with 23 million subscribers. Comcast Corp. (Nasdaq: CMCSA), with 27 million subscribers, will remain No.1. The Charter-Time Warner merger comes just one month after the collapse of Comcast's $45.2 billion bid for TWC. That deal fell through under pressure from Washington regulators, particularly the Federal Communications Commission (FCC). The Charter-Time Warner merger figures to have an easier path. The Wall Street Journal reported last week that FCC chairman Tom Wheeler called the CEOs of both companies to assure them that his agency was not opposed to mergers in the industry, but would judge each on its merits. The FCC is likely to look more favorably on the Charter-Time Warner merger. "It does not look to be nearly as big an antitrust concern as the Comcast deal was," Gene Kimmelman, the chief executive of Public Knowledge, a consumer advocacy group, told The New York Times. "In this instance, you're combining the No. 2 company with a smaller player that can be a bit of a counterweight to Comcast." The cash-and-stock deal values TWC stock at $195 a share, a 14% gain from Friday's closing price of $171.18. Investors hedged a bit today, pushing TWC stock up 7.3% today (Tuesday) to $183.60. CHTR stock was up 2.5% to $179.78, showing just how much Wall Street likes the deal. The overall market was negative, with most major stock indexes down about 1%. The Charter-Time Warner merger comes in the wake of two decades of consolidation and a spike in M&A activity in the cable industry over the past year.